BUZZ is the low cost-subsidiary of KLM uk Ltd, founded in 1999 (started in Jan.2000) in competition of other low-cost operators such as easyJet and Go (founded by British Airways). 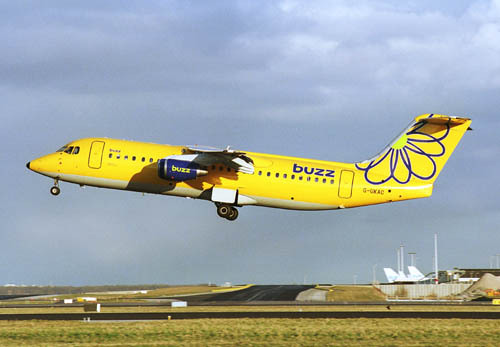 When KLM reorganized in 2002 with KLM uk merging with KLM Cityhopper (KLM Cityhopper UK Ltd. as from 01Nov02), Buzz was made an independent subsidiary of KLM. The change in livery is a subtle one, with the name on the fuselage a different size on a revised location and the flower-like drawing on the tail changed into a plane. BAe 146-300 G-UKAC (cn E3142) is seen here taking off from runway 01L at Amsterdam on a fine day in February 2000. The flights originate from London-Stansted, but with the reorganisation flights should operate mainly from Bournemouth. Buzz started with 8 BAe 146s, but later 2 Boeing 737s were added (G-BZZA & G-BZZB). G-BZZE was a recent addition to Buzz when I photographed it at Amsterdam on 24Jan03. Its former identity was N14381, a Boeing 737-3Q8 (cn 26310/2680) previously in use with Continental Airlines. 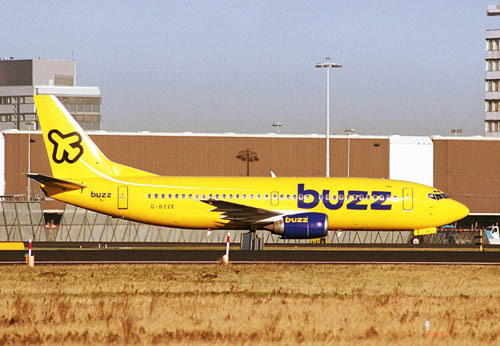 In 2002 KLM announced the purchase of 7 former Continental 737-300s to expand the fleet of Buzz. AMSTELVEEN, January 31, 2003 - KLM Royal Dutch Airlines today announced that they have signed an agreement for the sale of buzz, KLM Group's low cost subsidiary, to Ryanair. KLM will sell its 100% shareholding in buzz with a value to KLM of approximately Euro 30 million. By mutual agreement, buzz will be transferred once regulatory authorities have approved the transaction. Parties are aiming for this transfer to take place on or before April 1, 2003. KLM's decision to sell buzz follows a strategic review of this business in light of the increasing competition in the European low cost arena over the last few months. As indicated in late October 2002, buzz was aiming for rapid growth to maintain its position as the 3rd largest player in Europe in this market segment. In order to finance the expansion, KLM has indicated that it was considering partnership approaches from a number of interested parties, which included the possibility of an outright sale. KLM believes that attaining satisfactory profitability for a standalone buzz would have been difficult to achieve. The emergence of a significant number of new entrants in the already competitive low cost arena will continue to lead to increasing price competition. In addition, the traditional network carriers, in their response to changing consumer demands, have started to focus on the low-cost customer as well by reforming their current European product and pricing strategies. Against this background, KLM's Board of Managing Directors has concluded that the plans of buzz are best served with a link up with the Irish low cost carrier Ryanair. Bookings for buzz are being taken as normal for the current and summer schedules. We will provide updates as soon as we have further news. The price of Euro 30 million included a cash payment of only Euro 5 million to KLM. As part of the deal it was agreed that KLM would keep the BAe 146s. The price of the BAe 146s were valued at aprox. Euro 6.1 million and the rest of the money came from a cash balance. Michael O'Leary of Ryanair classified it as "a bargain".